With the hot weather in Boston, we've been eating cold dinners more often. We usually do a green salad along with a more substantial salad that includes some protein. The other day, I was trying to come up with a main dish salad including beets that I could serve cold for dinner on a hot summer night. I thought chickpeas would work well with the beets and would help make the salad more filling. I like beets best roasted and tossed with vinegar, so I decided to stick with that idea. I got some inspiration from this recipe, and decided to add some cumin to the dressing. And with some chopped onion, parsley, and mint, the salad was complete. I loved the way this salad came out. It was very flavorful and made a great light dinner. And the leftovers were even better at lunch the next day! Preheat oven to 350 deg F. Wash beets and trim stems to 1 inch. Place beets in a baking pan or oven safe dish, add enough water to cover the bottom, and cover the dish tightly (use aluminum foil if the dish doesn't have a cover). Roast beets in preheated oven until they can be pierced easily with the tip of a sharp knife. This could take 30-60 minutes or so, depending on the size of the beets. When beets are tender, remove them from the dish and cool. When beets are cool enough to touch, slip off their peels. Cut beets into approximately 1-inch pieces. Place beets in a large bowl, and toss with onions and 1 tbs vinegar. Refrigerate until cool. Stir cumin seeds in a dry skillet over medium heat until they are lightly toasted and turn a shade darker, about 2 minutes. Coarsely grind cumin seeds with a spice grinder or mortar and pestle. Whisk cumin together with olive oil and remaining 1 tbs vinegar. 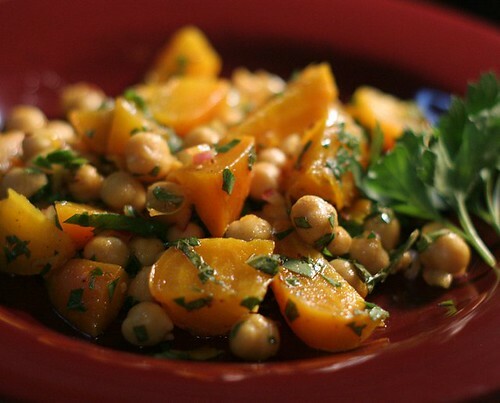 Add chickpeas, parsley, and mint to the beets, and toss with dressing. Add salt and pepper to taste. Salad can be served immediately or refrigerated for 1-2 days before serving. Mmmmm - looks amazing! I will have to try this one..